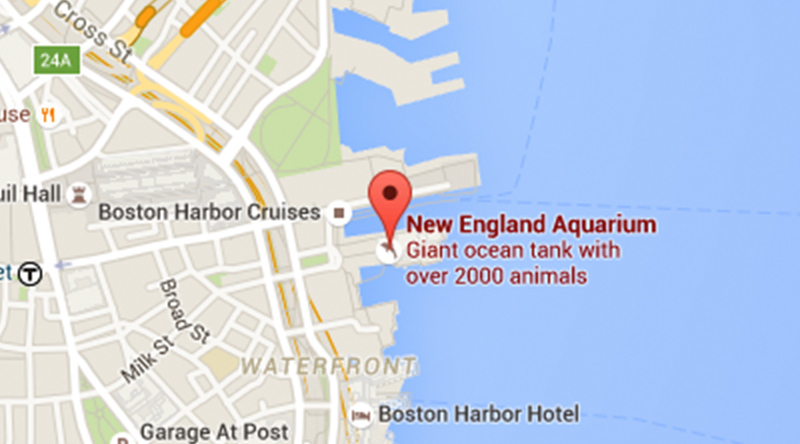 A hardworking and passionate team cares for the seals and sea lions at the New England Aquarium. One of those trainers often breaks out his tools and creativity to make enriching activities for these remarkable marine mammals. Sean Rothwell graduated from the University of Kansas, where he studied behavioral psychology. His passion for marine life took him from the Kansas flats to the New England coasts. 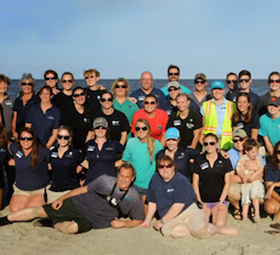 In 2014, he participated in the Marine Mammal Department’s internship program. During this time, he has also began working on large -scale beach cleanup efforts, helping fight the threat of marine debris. 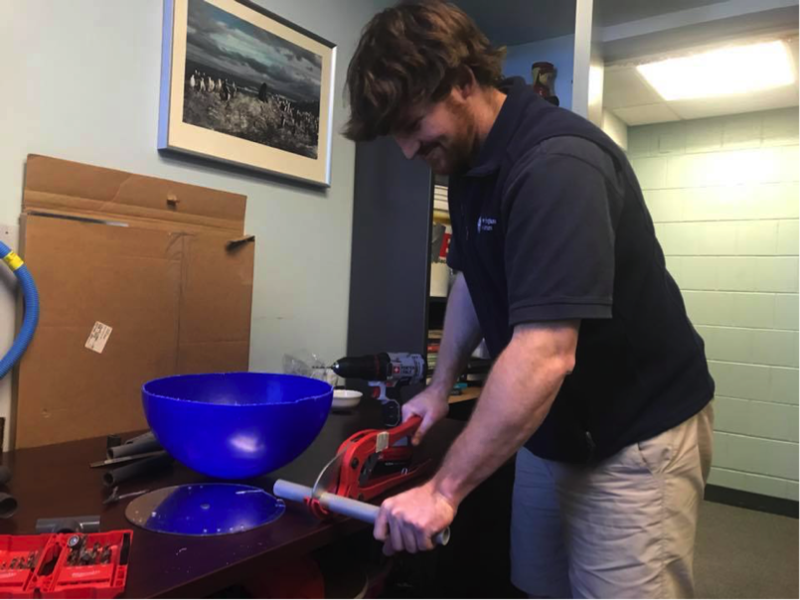 Sean is currently a member of the New England Aquarium Marine Mammal Trainer staff, and his primary role is pinniped husbandry and enrichment. Through his work, he hopes to inspire ocean stewardship and promote a healthy environment for animals living in human care and the ocean. Sean creates a toy for the seals and sea lions. Enrichment encourages natural behaviors like forging, grooming, tracking, and play, as well as increasing physical activity. It also engages the seals and sea lions in problem-solving and enhances their environment in a variety of ways. My overall goal when designing and creating enrichment for animals under human care is to construct interactive devices that will be engaging for the animals. How many times a day do you offer enrichment and what do you give them? Our staff and volunteers participate in nine preplanned enrichment sessions between the two exhibits (the New Balance Foundation Marine Mammal Center and the Atlantic Harbor Seal exhibit). And if we have any downtime, it’s a safe bet that you will find us out on exhibit interacting with the animals. A session might involve fish, or playing with a water hose, or maybe gelatin, or even musical instruments. 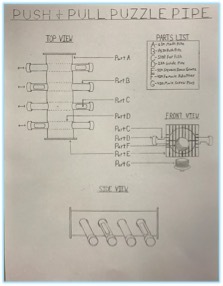 One of my main responsibilities is designing and constructing more complex enrichment devices. An assortment of toys: boomer ball x, boomer caterpillar, and a kelp mop! A seal lion seeks out a stream from the dual hose sprayer. 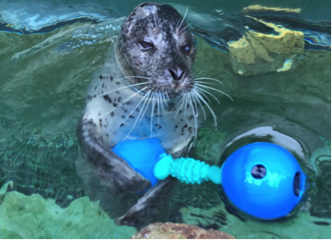 A harbor seal plays with a boomerball dumbell. Are there any special considerations you have to think of when designing a new toy? Absolutely! 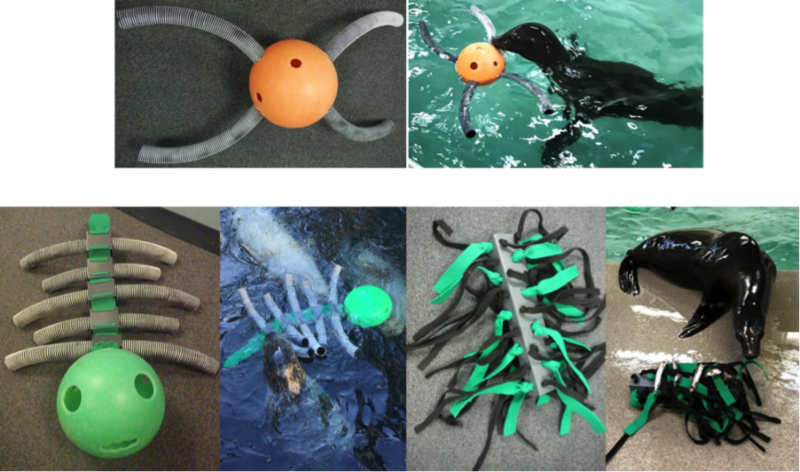 When designing toys for the seals and sea lions there are lots of things to consider. First and foremost, we have to think about safety. Is it is too big or too small for that species? Are there any loose parts or any entanglement concerns? Is it all made of nontoxic materials? We also consider the durability of a toy. 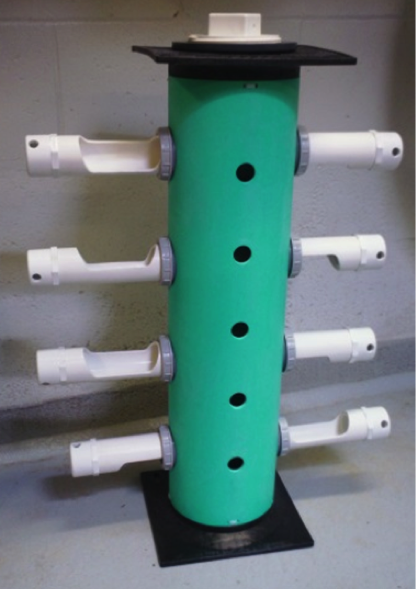 Enrichment devices should be constructed out of materials that can withstand rough play, chewing, and use in water, over a long period of time. Another aspect to consider is the object’s dynamic design. Enrichment devices should be designed in a way that allows them to be easily altered as needed to increase both animal engagement and safety. It is also very important that they are easy to sanitize after each use. We have to think about the materials used. Due to budget and environmental consideration, enrichment devices should be constructed from found and/or recycled materials whenever possible. And should also be easy to acquire, to ensure devices can be easily duplicated and repaired. This Flap Box toy can be used both on land and in the water. It is one of Kitovi’s favorite foraging toys—watch her move around the box, looking through the clear container then lifting the lid to find the squid inside. Where do your ideas come from? How do you come up with a new idea? Starting with a behavior I want to encourage or maybe modify, I think of it like a hypothesis—what can be built to encourage or prevent this behavior? The idea is the first part, but the collection of materials is the big part. Trying to make sure to use what is available, or can be reused. Like maybe an old piece of fire hose. A lot of times keeping old supplies that I might eventually use snowballs into making something new. Once I’ve gathered the parts, then I sketch out the idea and put into action. A toy for the marine mammals starts with a sketch. After a lot of hard construction work, the finished toy is ready to be put to the test. 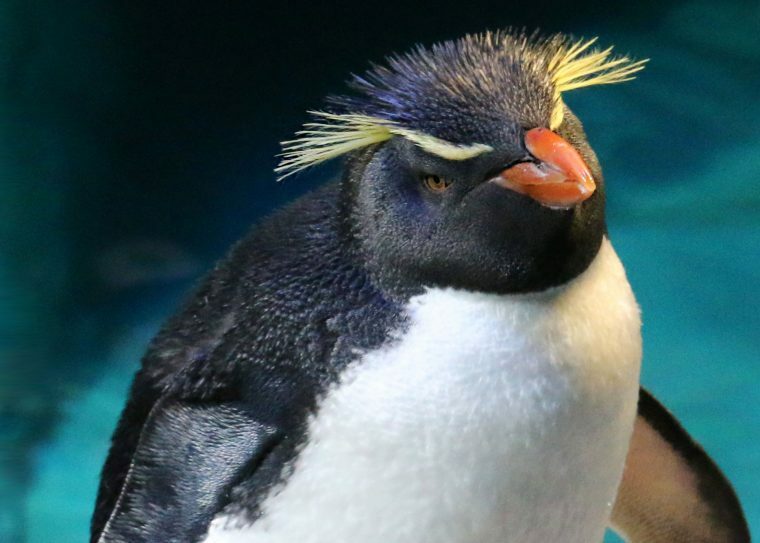 What is one thing that you’d like our visitors to know about enrichment? Enrichment is an important part of the day, just like eating the right foods and getting vitamins or medicine. 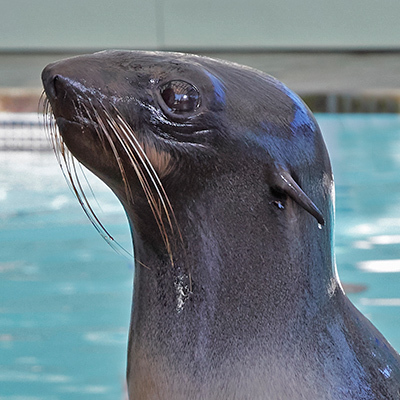 Enrichment helps keep our seals and sea lions mentally and physically active. 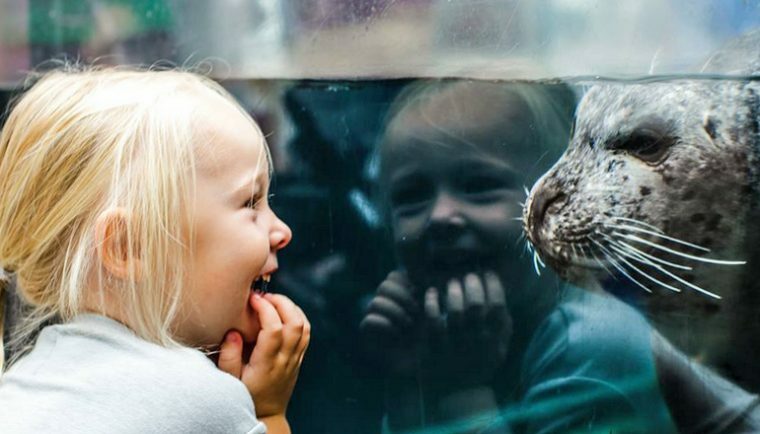 So next time you visit us, take a look around the New Balance Foundation Marine Mammal Center and the harbor seal exhibit and see if you can spot some enrichment taking place!